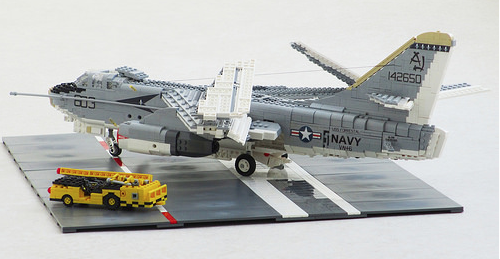 Flickr’s Dornbi has appeared here numerous times with his stunning Lego aircraft. 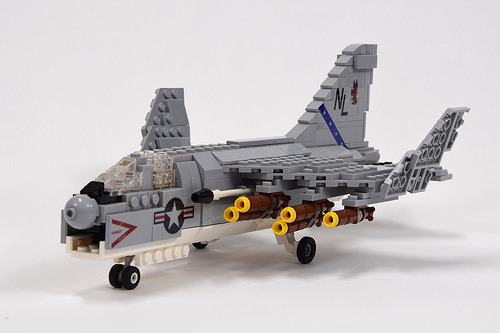 He’s recently pictured three of his historic US Navy planes together, with the F14a Tomcat, A-6E Intruder and A-7E Corsair all faithfully recreated in grey and white bricks. There’s more to see of each at Dornbi’s photostream – click there for the full set of images. This wonderfully weird contraption is a Northrop Grumman E-2C Hawkeye airborne early warning (AEW) aircraft, currently serving in the U.S Navy aircraft carrier fleet. First flying in 1960, the E-2 Hawkeye is not only still in service some five decades later, but is actually still in production, giving it the longest production run of any carrier-based aircraft. The huge disc atop the Hawkeye is a 24-foot rotating radar dome equipped with long-range radar and IFF systems, the only carrier-based aircraft to possess such technology. This enormous eye/ear allows the E-2 to detect incoming threats long before they become a danger, allowing the carrier upon which it’s stationed to prepare defences. This may not be a car, or even completely LEGO, but it is a stunning build nevertheless. TLCB regular Daniel Siskind is back with another superb military creation. Built utilising third-party Brickarms weaponry, thirteen custom mini-figures, and a third-party Brickmania flag, Daniel has created a near perfect replica of Elco Motor Torpedo Boat PT-109. PT-109 was one of hundreds of Patrol Torpedo boats built in the 1940s by the U.S for service in the Pacific theatre. However PT-109 is more noteworthy than most due to both its fate, and the man that commanded it. Lieutenant John F. Kennedy, who would later become the 35th President of the United States, was aboard the PT-109 in the dead of night on August 2nd 1943. The boat was idling so as to remain undetected by Japanese warships when, in a (probable) freak accident, it was run down a severed in two by the Japanese warship Amagiri. Two of the thirteen crew were killed as PT-109 exploded, and the remaining eleven survivors clung to one half of the boat as it drifted through the night. As it became apparent that what was left of the ship would soon sink, Kennedy and his crew decided to abandon it for land, swimming 5.6km to a tiny uninhabited island, with Kennedy towing a badly burned crew member the entire way. Unfortunately the island the crew found themselves on had no food or drinking water, so Kennedy swam to the nearby Olasana islands in search of a more habitable refuge. Finding coconuts and clean water he then led the crew to their new island home, hiding from the passing Japanese boats. 6 days later the crew of PT-109 were rescued, and Kennedy was awarded the Navy and Marine Corps Medal and Purple Heart. This fitting tribute to one of the Second World War’s more remarkable feats of survival can be seen in greater detail at Daniel Siskind’s PT-109 album – click the link above to see the full gallery of images, which includes several interior shots of the boat and a close-up of the custom-made mini-figure crew. John F. Kennedy was elected the 35th President of the Unites States in 1961, and died by assassination on November 22nd 1963. We don’t blog planes all that much here at The Lego Car Blog, but sometimes a model arrives that is so stupendously brilliant that we forget our car bias for a bit. This is one of those times. This magnificent creation is a 1:15 scale, 8,000 piece replica of the formidable carrier-based F-14A ‘Tomcat’. It’s been built over the last 9 months crash_cramer of Flickr, and it’s a truly remarkable build. With LEGO Power Functions operating various aeronautical functionality, custom LED engine sequencing, custom decals, and a vacuum-formed canopy, the attention to detail, even if it’s not quite all LEGO, is astonishing. The whole model measures well over 1.2 metres long and it’s really worth a closer look. You can see all of the incredible images on Flickr – click the link above and wind the catapult back. Kingfisher. It’s a name that’s used a lot. For a children’s book publisher. A rather good beer. An airline. A bird. And this; the World War II era Vought OS2U floatplane. Over 1,500 Vought Kingfishers were produced after its introduction in the late ’30s, and we think it might be one of the prettiest planes ever made. 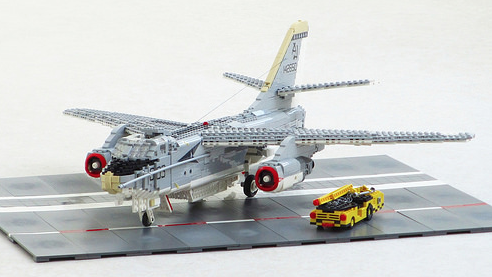 TLCB favourite Henrik Jensen has reproduced the unusual aircraft superbly, and you can see more his recreation on MOCpages. Fighter aircraft seem to always have cool names. Well, apart from Russian ones, as the Soviets apparently banned creativity and decreed that everything must be called only by a number. Anyway, Tornado, Jaguar, Lightning, Typhoon, Thunderbolt all feature in our ‘cool names’ list, but this is perhaps the best; the FM-2 Wildcat. Ralph Savelsberg is the builder of this exquisite Lego recreation, and you can see more of his latest work via his Flickr photostream. Ralph also recently joined us as the penultimate builder in our Master MOCers Series; Read his interview here! Not really a car, but a good excuse for a Lynryd Skynryd song title. Lukasz Wiktorowicz’s US Navy battleship is one of the smoothest, cleanest and most perfect creations the Elves have found this year. The polar opposite of them in fact. See more on Flickr here. Here at The Lego Car Blog we love to hear your feedback and your suggestions if our Elves have missed a creation worth posting. A little outside competition helps to keep them sharp too. This post was suggested to us via the Feedback and Submission Suggestions page by one of our readers, and although it’s not a car we do occasionally blog other transport-related creations. It is in fact a 1/350 replica of the USS Missouri battleship that saw service in World War 2 and the Pacific, built by a previous ‘Featured TFOL (Teen Fan Of Lego)’ Achintya Prasad. See all the photos, and a video demonstrating the motorised rotating fore guns, on either MOCpages or Flickr. If you’ve found a creation our Elves have missed and you think it should be here please visit our Submission Guidelines. Please note that self-requests are not encouraged. This beautiful replica of the Norwegian/Danish Navy brig HDMS Lougen, designed and built by Anders T on MOCpages, is one of the finest Lego ships we’ve seen yet. Armed with 18 short guns and 6 long guns, the Lougen was formidably armed for a relatively small and nimble warship. It was also the first class serving in the Norwegian/Danish Navy to be constructed from a copper hull. Anders’ has created his Lego version in mini-figure scale, and it contains a breathtaking amount of detail. To see the full gallery click his name above.